Tovi was explaining to me her anxieties about high school. After seven successful years of homeschooling, high school was making her nervous. She sought help from a company with certified teachers and an accredited program. Instead of supporting her successful homeschool, they told her not to use the curriculum she had chosen. Personal preference. Even though the curriculum was popular and successful among homeschool families, the teacher just didn't prefer it. It simply wasn't her cup of tea. Tovi left that meeting feeling more insecure and incapable. Fortunately, because she was a veteran homeschooler, she didn't stop there but continued to look for help that was a better fit for her family. That's how she found me. "That one phrase on your website got me," she said. "I will not judge your homeschool or evaluate your children." That was how she ended up with me, talking about curriculum. When you are starting high school and feeling a bit insecure, how do you go about choosing curriculum? Here are ten proven strategies to help you make successful curriculum decisions. Finally, if you're still stuck after all that, I'll share my personal "starting points" for choosing curriculum so you can see the things that I used. Strategy 1: Use What Works If you have been homeschooling for awhile, you probably have a good idea about what curriculum will work with your kids. Look back at your successful homeschool years and think about what you used that worked. Find a curriculum that is most similar to what worked each year. Your mantra should be "If it works, keep using it." The grass will always be greener on the other side of the fence, but maybe the grass is Astroturf. If your grass is already green, don't look somewhere else. When I work with clients, I always suggest that they keep using a curriculum that works. If Sonlight has always worked for you, keep using Sonlight. Of course, the flip side is also true. If something is NOT working, that's when you start looking around for something else. Even if you are in the middle of a school year, once you recognize a curriculum isn't working, change as SOON as possible. It will save you so much frustration! Strategy 2: Do What Works When you are looking for something new, how do you know where to begin? As you are shop for curriculum, the learning styles of you and your children can help guide your choices. If your children work best with workbooks, then keep using what works (see Strategy 1.) In high school, some students will do their schoolwork in notebooks. If your children have done very well with hands-on projects, keep using them! Even in the high school years, there are plenty of natural learning opportunities. Boy Scouts, 4-H, Patty Paper Geometry, and YMCA Youth and Government are all great hands-on learning. Look around until you find a match for your children's learning style. My children learned best by reading. Whenever I got stuck with a curriculum that didn't work, we went back to our roots - reading. Sometimes my curriculum choice just flat out didn't work - art comes to mind! That's when we would read about the topic instead, which meant reading books about art history. "Do What Works" also means using a curriculum provider that you have used in the past. I used Sonlight Curriculum, and it was perfect for our family. When I decided to try teaching Latin, I used the program that Sonlight provides. I figured that if Sonlight was working for me, then I could trust the people to choose a good Latin program. So if it worked for them, and looked good to them, it would probably work for me as well. Place a higher value on recommendations from curriculum suppliers that work for you. Strategy 3: Use Homeschool Curriculum A textbook written for a public or private school assumes that the teacher already understands the subject. A book written for homeschoolers assumes that the teacher knows NOTHING about the subject! That's why homeschool curriculum is easier to use and makes you feel competent, not stupid. Curriculum written for homeschoolers doesn't assume that your child is in a classroom setting, and suggest impractical group projects. When you use curriculum that is meant for homeschooling, you can teach subjects without help, even when you don't have a clue about the content. My children learned physics and calculus without any help from me! We were successful because we used the formula "homeschool curriculum + their effort = success." Strategy 4: Self-Teaching Curriculum Homeschool curriculum works because it's usually self-teaching. Your ultimate goal is NOT to be the "teacher" of a subject. Your long-term plan is to make learners who can absorb material by themselves. Searching for self-teaching curriculum is a good thing that will prepare your students for college and life. It will help you to teach things you don't know, and help your children learn subjects primarily by themselves. When students go to college, they will need to absorb college textbooks by themselves. Choosing a self-teaching curriculum will give them the practice they need in order to do that in college. Strategy 5: Don't Start Over Most curriculum suppliers think that their curriculum is the living end. They thinks it is the best, that it teaches the best, that their way is the right way, and without them you can't possibly learn all you need to know. A writing program may tell you to start at level one, even though your student is in high school, just so that they can follow their program completely. A math program may tell you that even a 9th grader should start their curriculum learning basic addition. There are probably some good reasons for starting over, and you will know if that's important for your children. On the other hand, starting over is NOT always important or advisable. For example, when a curriculum has a placement test, there is no reason to start at the beginning. I have seen parents start over with a different math program every year, putting their child further and further behind. Resist the urge to start over when you purchase a new curriculum. Start where it makes sense for YOUR child. Strategy 6: Encourage Specialization Buy curriculum that covers all the basics, certainly. You can't skimp on reading, writing, math, science, and social studies. On the other hand, you also want to choose curriculum that will encourage their passion! If your child loves art, music, or science, remember to buy those! I'm reminded of the Bible verse, "If his son shall ask bread, will he give him a stone? (Matthew 7:9.) If your child ASKS for a subject, give it to them! If they ask for microbiology, or economics, or Russian History, follow their interests and get it for them. Try to avoid taking those passions and making it a "school subject." I remember a client, who wanted to encourage her student's interest, so she turned it into a homeschool course - complete with assignments, worksheets, and tests. Strangely enough, her student lost interest in the subject when it became a dreaded "class" that he had to work on. Don't make specialization a subject, just let them enjoy it. Then when they are done, put it on the transcript! Strategy 7: Invest In Your Weaknesses Where is the best place to put our hard-earned curriculum money? Invest in your weaknesses! If you hate math, and you don't know what you're doing in the subject, and you avoid it at all costs, then THAT is where to put your money. Our strengths are fun to finance, and areas of specialization will often result in birthday and Christmas presents. But purchasing things for our weaknesses take conscious effort. What do you hate teaching? Which subjects do you feel like you're failing? That's the best place to put your curriculum dollar. If you need to, you could teach all the "fun stuff" in the library and real life, but weak areas may need a little extra help. Strategy 8: Allow Teens to Choose It's also helpful to have your teen choose curriculum - ESPECIALLY in their weak areas. As your teens progress, try to engage them in curriculum choosing. If you can come up with two or three suitable alternatives for a subject, and you just can't decide, then perhaps your teen can place the deciding vote. That will often help to reduce whining. After all, who can they blame? They chose it themselves! This strategy is especially important when you are looking at a video curriculum of any kind. Teens are remarkably sensitive to visual programs. Things that look just fine to us may drive them crazy! Maybe it's the way a speaker dresses, or the sound of their voice, but sometimes a video will annoy kids so much they can't learn. Whenever possible, have your teens compare video samples, and make the choice for themselves. Even without a video, you may still be surprised at their choices. I remember being stunned when my son Kevin chose Saxon math! Believe it or not, he was looking for a book that had pages full of math problems. Meanwhile, I had been shopping for a curriculum with clearly written instructions and colorful photos and diagrams. Let your teen help you choose curriculum, and you could be pleasantly surprised. Strategy 9: Invest in Yourself Each year, spend some of your curriculum dollars on yourself. Invest your money in keeping yourself organized, knowledgeable, and excited about teaching. When my oldest was in 7th grade, I started buying myself a book each year about high school. By the time he started 9th grade, I understood the basics of high school. I kept investing in myself each year. I learned about college admissions, scholarships, and high school tests. I learned about being the guidance counselor, and homeschooling college courses. If books aren't your thing, invest in getting some consulting. 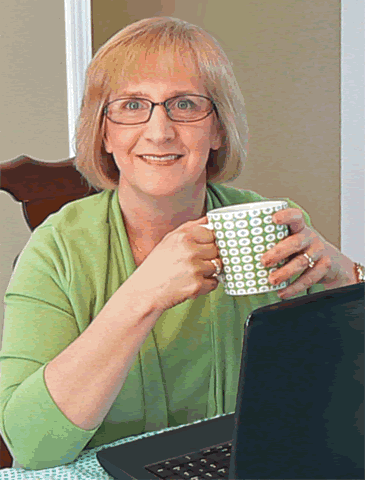 I know of a pretty good homeschool consultant if you need one! I found that everything I spent on myself ended up saving our family a lot in the long run. Because of my studies, we won scholarships through our English program, and our college essays brought wonderful financial aid. Investing in yourself will help you feel more confident now, but can also reap wonderful long term rewards. Strategy 10: Tried and True When you are looking at curriculum choices, try to choose something that is tried and true. Do you remember the crisis over "New Math" in public schools? Have you ever wondered why public school budgets are so high while schools are throwing away perfectly fine curriculum? Schools are always on the lookout for the "latest and greatest" thing, and lose sight of the "tried and true" curriculum. Frankly, that's a rut that homeschoolers can fall into as well. We want the new edition, the updated version, and the latest new curriculum. But at what cost? The book MAY be a good new curriculum, it's true. It might also stink. If you have some extra money and the latest and greatest is important to you, then feel free to get the newest choices. If you have the money to correct any duds, then there is no harm in that! If you don't have the financial flexibility to make frequent mistakes, then consider using only tried and true curriculum. Conclusion: Starting Points If you have no idea where to start, then look for clues around you. Look at your homeschooling friends. What do they use? Does it look good? Do you trust their judgment? Do their kids seem to be learning? Look at curriculum suppliers that you know and trust. If you trust them for science, perhaps you could try their history program. Research similar curriculum choices on the internet. If your child likes video tutorials for math, try finding a video tutorial for foreign language. Look for award winners. You can find those award winners in magazines like "The Old Schoolhouse" and books like "100 Top Picks for Homeschool Curriculum" by Cathy Duffy (of Cathy Duffy Reviews) or through HomeEdExpert.com. If you really don't even know where to begin, or if you haven't homeschooled before, then you can try my curriculum favorites, and see if they fit your family. I used Sonlight Curriculum, because it is geared to learning through reading. Although we used it in the traditional way, their boxes of books could really provide a year of unschooling for a student who loves to read. I used Rock Solid when I searched for new subjects, because they don't have an overwhelming number of choices - just a few of each. I recommend Apologia Sciences (even to my clients who don't usually use Christian curriculum) because they provide such thorough college prep high school science courses. Home Science Tools was my favorite provider for lab science, because they have science ideas for every subject in every age group AND they have great customer service. You are the love-givers of your child. You are the one who knows them best. Nobody else can tell you what curriculum to use without their biases shading their opinions. Use what you know about your children to make your decisions. Invest in your future by putting your money into yourself and your weaknesses first. Provide the basics, of course, but also invest in the loves and interests of your students. This is a stressful time of year, when your curriculum budget takes the biggest hit. But take heart! You know your child, and you can make better decisions with your money that anyone else! Copyright © 2015 The HomeScholar LLC, www.HomeHighSchoolHelp.com. Text may be reprinted without permission if used in full, except for use in a book or other publication for rent or for sale. 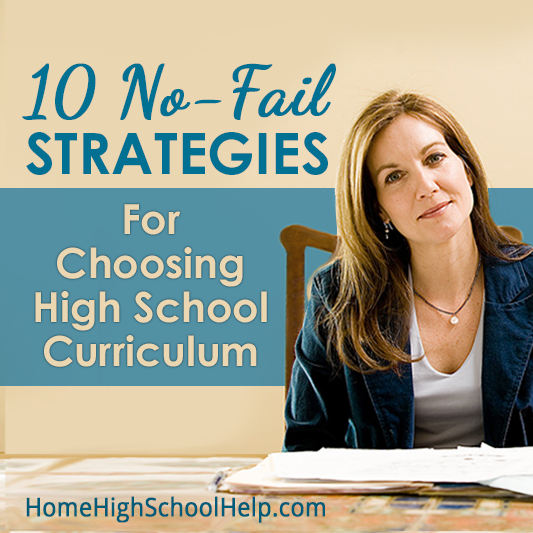 Reprint must include this copyright, bio (below), and the original URL link (http://www.HomeHighSchoolHelp.com/10-no-fail-strategies-for-choosing-high-school-curriculum).